GONE: Excellent, but convoluted, Virgin / Delta business class deals to the US from £939! 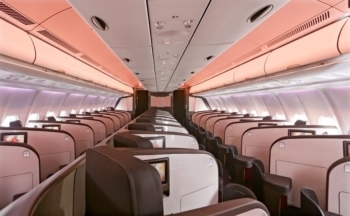 Virgin Atlantic is currently selling some exceptionally cheap – no argument there – Business Class flights to the United States. It is unfortunately a niche deal on connecting flights only. If you can make it work for you then, of course, you clearly are not beating this price anywhere else. Since all of the trips involve a connection, part or all of your journey will be on Delta. There are no ‘100% Virgin Atlantic’ services. However, if your transatlantic leg is on Delta you CAN still use Virgin Clubhouse lounge in Heathrow Terminal 3 and your flight will earn miles and tier points in Virgin Flying Club. You can find out more about Virgin Upper Class on their site here although some routings may be entirely on Delta – take care when booking. You will often get a variety of options. Undoubtedly. You will have to change planes on your trip, but it is very rare that you get a price like this which starts in the UK as opposed to some odd EU capital. Just booked for Xmas in Phoenix – £979 each in Delta One & FC internal flights. BA Gold but not a delta or virgin club member – where should I credit the miles to ? It is generally easier to top up Virgin rather than Delta, although both are UK Amex partners. Delta has more redemption options (all of SkyTeam) although Virgin gains KLM and Air France later this year. It appears not. but it seems that open jaw is permitted – e.g. out to Dallas, return from New Orleans. My US geography is terrible but someone might be able to make a nice little road trip out of it or multi-city break with a cheap/redemption connecting flight. If renting a car for a road trip beware of one way charges. Best to find out what they are before booking. It seems taking a one way car rental starting and ending in the same State if often fine and no extra charge or minimal. However renting in one State and leaving in another does seem to cost and not even be possible at all. Exception might be the seasonal one way rentals when the hire companies are actually looking for renters to drive the vehicles from and to specifed places which do run across State borders. What sort of virgin tier points you get for one of these flights? So a bargain to Denver in winter? Perfect for the Rockies ski season! Off-topic: Virgin Atlantic is switching around its planes on the LHRSEA route again. I’m now scheduled to fly on an aircraft just shown as “L3W” (in the location on the web page where for a different flight I’m seeing “Airbus A330-300”). Any idea what “L3W” means? Issues with the 787 causing problems with the scheduling of flights. Yeah I know that, but what’s an “L3W”? Unable to get further than seeing prices on both VS and DL sites before they crash! Possible Chicago option is to book to another city and get a separate connection. Delta interline bags even on separate tickets so you should have no problem if you miss ther connection. Booked LHR-FLL for £820 in Delta One! HOWEVER, I made the booking on Saturday and it’s still not ticketed, so hope it’s not a glitch and won’t be cancelled …..
American Airlines ticketing often takes a couple of days, so Delta could be similar. Got pulled around 2pm, sorry.